Shine up those brown Stacy Adams and get ready to look grown man sharp in this brown leisure suit with short sleeves by Fortino. If you have an image to maintain, you need to do it the right way the first time and wearing your Stacy Adams shoes and this sharp looking brown leisure suit with short sleeves. 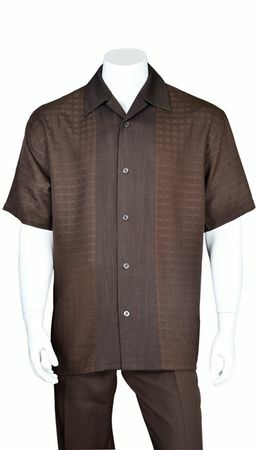 It's a complete outfit that has a short sleeve brown open collar shirt with a checker panel front and the pleated pants complete this brown leisure suit with short sleeves.